An epic new adventure series from bestselling author Adam Blade - with amazing comic-book style illustrations. JACK, RUBY AND DANNY FACE A DEADLY ROBOTIC FOE! RUBY'S MOTHER HAS VANISHED INTO THE DEPTHS OF THE JUNGLE. 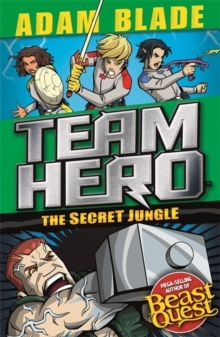 TO FIND HER, TEAM HERO MUST EXPLORE A NEW, VAST LANDSCAPE - AND DO BATTLE WITH A GIANT ROBOT!